Forgiveness. Redemption. Healing. Can you always repair something that you broke if you try hard enough? Or will some things remain forever broken? Can we do bad things, I mean really bad things, and somehow wash our souls clean to become "good" again? Can you forgive someone who's responsible for the greatest hurt of your life? And if not, how do you ever recover from that hurt? These are some of the ideas and questions brought to mind by the beautiful and devastating new play Cardboard Piano at Park Square Theatre. You know a love story between two young women in Uganda on the eve of the new millennium will not end happily, and this one sure doesn't. It left me feeling absolutely broken. But perhaps hopeful that healing can be possible if we listen to each other and try to understand. Shortly after midnight at the turn of the last century, American missionary's daughter Chris (don't call her Christina!) and Ugandan orphan Adiel meet in Chris' father's church to get married. Of course it's not a legal ceremony, and they'd both be in grave danger if anyone found out about it, but nothing will stop young love. They have a few moments of bliss before a child soldier breaks in, on the run from the man who kidnapped him three years ago. Terrified, the boy named Pika at first holds a gun on the women, until he passes out from blood loss due to his severed ear, punishment for attempted escape. Chris wants the couple to run away so they can be together, but Adiel insists on helping Pika first. The little trio is getting along well, until a soldier arrives looking for Pika. And then... well, I won't spoil it here, but it leads to one of the most shocking and devastating Act I conclusions I've ever seen. The second act flashes forward 14 years, with the characters who survived Act I having either moved on and come to peace with the past, or still looking for redemption and healing. It's not an easy road and there are no easy answers, but this piece will reach into your chest and grab your heart with its complicated emotions. Director Signe V. Harriday and her excellent four-person cast navigate these complicated waters well. If this play were all trauma it would be unbearable, but there are moments of humor, romance, and above all humanity that provide at least some relief from the devastation. All of the actors, most of whom play two roles, bring such truth to their characters, bringing out the complicated layers of these beautifully flawed humans. Kiara Jackson and Adelin Phelps are charming as the young lovers, tested by their situation. #TCTheater newcomer Michael Jemison, while a bit tall for a 13-year-old, brings out the innocence and hardness of the child soldier. And Ansa Akyea, one of our best actors, will make you laugh and then absolutely break your heart in the second act as a man who thinks he has moved on from past trauma, only to have it all blow up again. Sorry for being evasive, I don't want to spoil what happens in the play, but trust me that this cast delivers everything that the script and director ask of them, which is a lot. After the play was over, I was so emotionally exhausted I could barely muster the energy to applaud, much less give the cast the standing ovation they deserved. 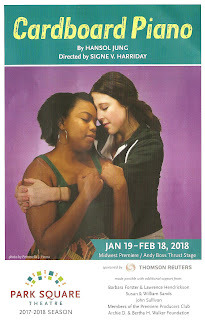 This is a play that should have a post-show discussion after every performance, so that we can all decompress from what we've just experienced. Park Square is working with the Center for Victims of Torture, who is hosting a pre-show discussion on Sunday January 28. They're also displaying artwork in the lobby, along with some community engagement boards where audience members can share their thoughts on some of the themes of the play. 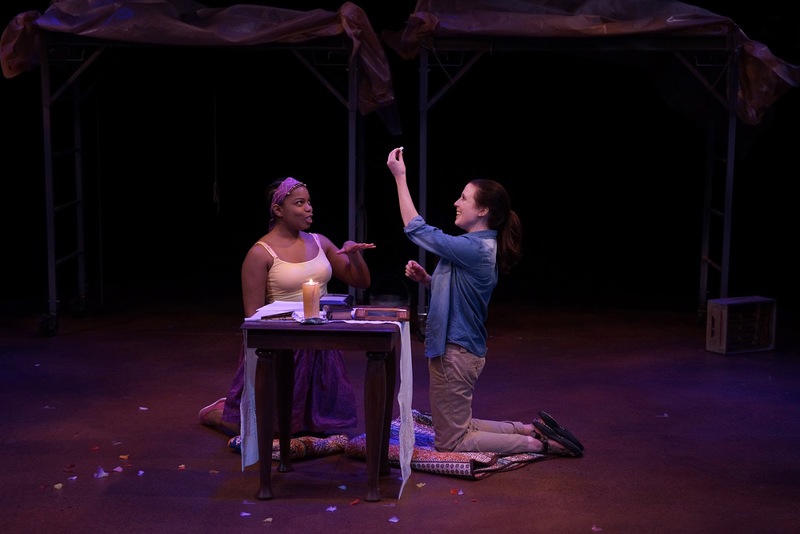 Cardboard Piano (and yes, the title will become clear to you and represents a pivotal moment in the story) is one of those plays that's more than just a play. Please visit lovely downtown St. Paul (now with an Ice Palace!) 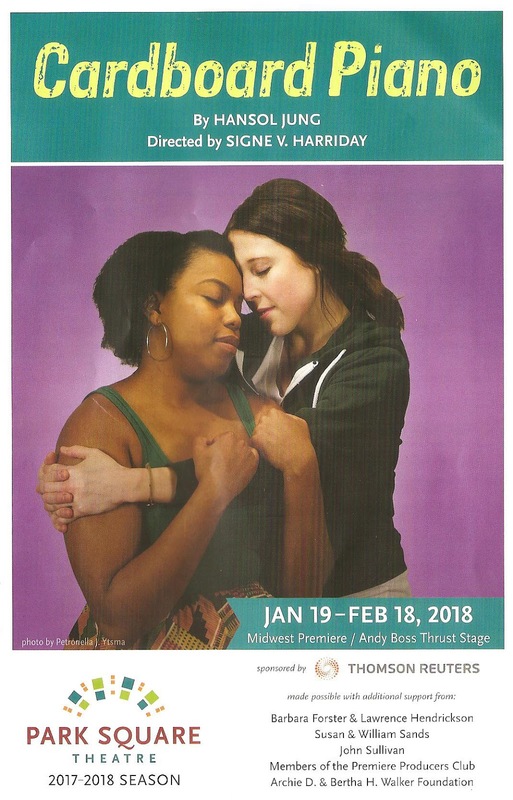 and witness this important story (told by a female playwright and a female director, BTW) before it closes on February 18. It's not an easy watch, but as is usually the case with such plays, it is so worth the effort.